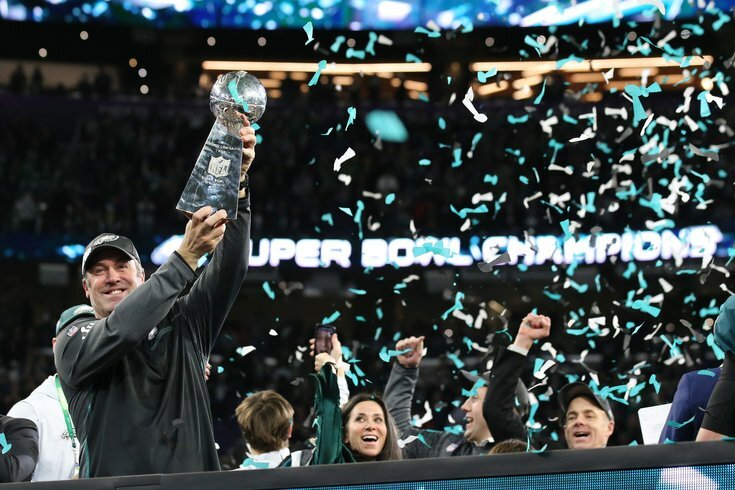 Doug Pederson celebrates with the Vince Lombardi Trophy after defeating the New England Patriots in Super Bowl LII at U.S. Bank Stadium. MINNEAPOLIS — Matt Patricia had a fear this would happen. The New England Patriots’ defensive coordinator swore before he faced off against Doug Pederson and the Eagles on Sunday in Super Bowl LII that he was bound to see a few new things from the Eagles’ offense. After the Eagles pulled off an amazing 41-33 victory for their first-ever Super Bowl, Patricia just nodded his head afterward at the postgame press conference. The Eagles did far more than he and the Patriots’ staff anticipated. That’s because Pederson stayed true to himself. When other coaches outthought themselves in trying to outsmart Bill Belichick and Patricia, the results were usually disastrous. In Super Bowl XLIX against Seattle, Seahawks’ coach Pete Carroll outwitted himself by going with that pass near the goal line that the Patriots practiced against all week, instead of just pounding Marshawn Lynch into the end zone. Last year, in Super Bowl LI, against Atlanta, then-Falcons’ offensive coordinator Kyle Shanahan, now head coach of the San Francisco 49ers, thought he would be one step ahead of Belichick and Patricia when he decided to pass with the ball at the New England 23 with less than four minutes to play. A field goal would have guaranteed the Atlanta Falcons a Super Bowl championship. Instead, Shanahan called a pass, thinking New England was expecting run. Matt Ryan was sacked for a 12-yard loss, and the following play Atlanta was called for a 10-yard holding penalty. Atlanta went from sitting at the 23 to the New England 45 in a blink. Ryan then was forced to pass and threw an incompletion. The Falcons had to punt and the Patriots rode off into history with the first overtime Super Bowl victory. Each time it seemed the Eagles were pinned down, Pederson was a step ahead. The play that exemplified everything was something called “The Philly Special,” when on fourth-and-goal at the New England 1-yard line with :34 left in the half, Super Bowl LII MVP Nick Foles looked like he was giving instructions to the offensive line when the Eagles did a direct snap to Corey Clement. Clement then flicked the ball to Trey Burton, a former college quarterback, coming from the left, and Burton pitched the ball to a wide-open Foles in the end zone for a 1-yard TD pass and a 22-12 Eagles’ lead. On the Eagles’ fourth-quarter go-ahead drive, a gutsy call to tight end Zach Ertz prolonged the drive, making a two-yard catch on fourth-and-one with 5:39 left to play at the Eagles’ 47. The play led to Ertz’s 11-yard touchdown reception with 2:21 left to play that gave the Eagles a 38-33 lead. Pederson said it’s really the players that allowed him to be aggressive. Frank Reich, the Eagles’ offensive coordinator, knows Pederson well. He says the aggressiveness has been there since he became the Eagles’ head coach. “Doug’s vision from the very beginning was that he was going to be aggressive, and the reason he was going to be aggressive was he believes in the players,” Reich said. “Doug let the players know that, feel that, and let them respond to that. It wasn’t instant. It took some time, two years, to prove it. And Doug proved that the plays he designs have worked over and over again.